We just replaced our iPhone 4 with an iPhone X. It will be traveling with us everywhere, but it needed to be ready for adventure first. Here’s how we set it up. Your iPhone will get damaged sooner or later, probably sooner, if you don’t keep it in a case. We can recommend two cases depending upon how you intend to use your phone. 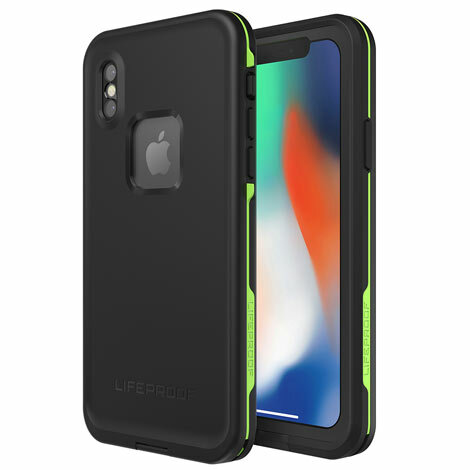 All in all, we recommend the LifeProof cases if you have an older phone that is not water resistant or if you really want to take the phone under water. The newer iPhones are water resistant, so if you don’t intend to take the phone under water, you have more options for a case. If you choose a Lifeproof case you will want the FRĒ or Nuud models so that it will fully waterproof your phone. 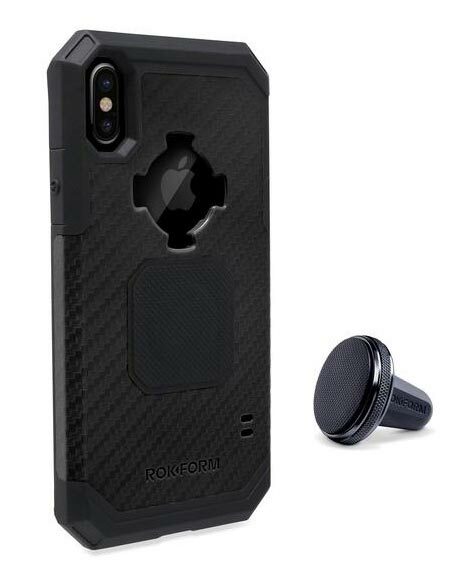 The people at Rokform sent us an iPhone X case to evaluate and we love it. It does not fully waterproof the phone, but we are not planning to take it under water. In addition, the iPhone 7, 8 and X are designed to meet IP67 ratings under IEC standard 60529. That means the phone itself is fully dust proof and will withstand immersion in water for up to 30 minutes at one meter depth. If you get caught in the rain or fall in a river, it’s just a matter of drying off the phone and proceeding. We do not recommend this case on older iPhones. This case also offers several accessories that allow it to mount in various ways (bicycle, motorcycle, car, etc. ), but the one that got our attention was the GoPro mount. More on that below. The screen is as responsive to gestures as without the case since the screen is not covered. The camera lens is not covered, so photo quality will not be affected. The main disadvantage for use outdoors is the magnet that is incorporated in the case. The high powered magnet is great for use with the car mount that comes with the case or if you want to attach your phone solidly to any metal object. However, besides messing with the magnetic strip on your credit cards and making it impossible to use a wireless charger, it makes the case unacceptable for adventure use. The magnet completely disables the iPhone X’s compass and any other apps that rely on that functionality. The Skyview app is one we use that will not work with the magnet in the case. In addition, there are some reports that the magnet affects the optical image stabilization when using the camera. The magnet doesn’t cause damage to the iPhone, but we understand that Apple recommends avoiding magnets for these reasons. We were ready to go with another case, when we learned that the magnet simply pops out of the case if you don’t want to use it and pops back in if you do. 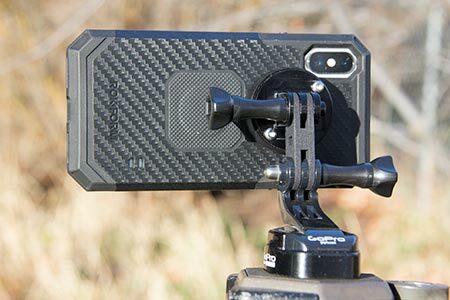 That resolved our concerns and we can now highly recommend the Rokform Rugged Case for iPhone X without the magnet. It’s the case we will be using. Screens on mobile phones break with some regularity and they can be quite expensive to replace. It costs $279 to replace the iPhone X screen unless you have insurance (typically a $200 deductible for a phone replacement) or the extended warrantee. With the AppleCare+ warrantee ($199), you can get two accidental damage repairs for $29 each within the two-year warrantee period. You really don’t want to break your screen anytime, but especially not if you are using the phone on an adventure. Thus we recommend a screen protector. A screen protector is simply a clear piece of plastic or glass that is placed over and adheres to the front of the phone. 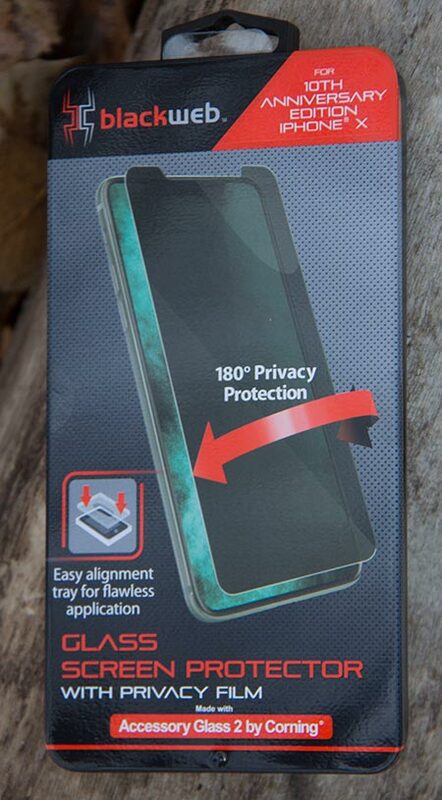 If your phone falls on its face the protector will help prevent breakage or scratching. I’ve used plastic protectors, but they wear through pretty quickly and seem to slow response to screen gestures. Thus I recommend a glass screen protector. These are typically about 0.4 mm thick and specifically designed for your phone. I picked up a Blackweb glass screen protector in a metal box for $17 at Walmart. The manufacturer claims up to a 25% reduction in breakage during a drop and a 500% improvement in scratch resistance over other glass protectors. There is no guarantee you won’t break your screen, but it should help some, especially with the case on your phone. The protector comes with a cloth, a wet wipe and a special sticky tape, so that you can get your screen perfectly clean before applying the protector. The box is also very helpful as it holds the phone in position and forces the protector to be properly positioned. The screen protector went on easily and it did not affect the use of the phone. 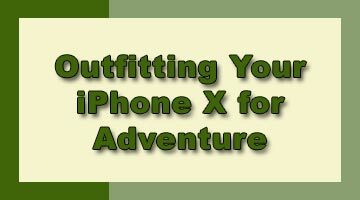 With your phone reasonably protected, you will want to add some accessories to help you when on your adventures. The magnetic vent mount that comes with the Rokform case works great and makes it really easy to use the phone in your car. Take the magnet out of the case, as we recommend, and the vent mount becomes useless. 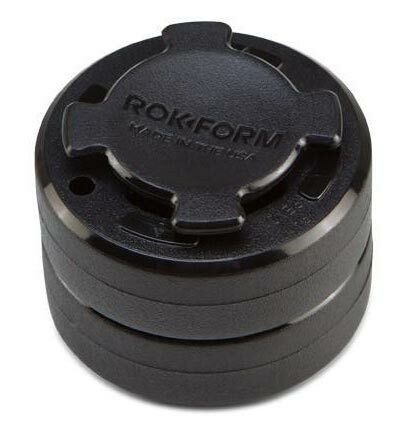 Rokform offers two dash mounts that adhere to a flat spot on your dash with 3M adhesive. Once stuck on the dash, you simply place the phone over the mount give it a little twist and the phone is locked to the dash in either vertical or horizontal position as you prefer. Their normal mount puts your phone close to the dash. We bought the extended mount so that the phone sits a little farther away. That allows it to fit over things that protrude from the dash and offers more space for your fingers when attaching or detaching your phone. 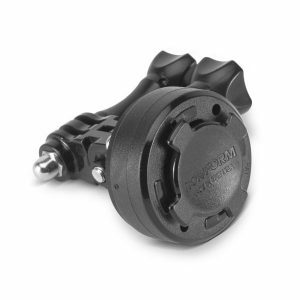 Rokform also offers a windshield suction mount. We have never had much success with suction mounts so we didn’t buy one. We have a GoPro Hero 3+. That model has WiFi, but lacks a screen. Newer GoPros have a screen, but they are tiny. The GoPro mount attaches the GoPro to the iPhone so that you can use the iPhone to display what the GoPro is seeing and to manage all the settings on the GoPro using the GoPro app. This is really helpful if you want to use a GoPro rather than the cameras on your new phone. We made one small addition to make the GoPro mount much more useful. That addition is a GoPro male to male adapter. We bought ours from Shapeways, a company that 3D prints various objects. The adapter allows the Rokform GoPro mount to work with mounts from GoPro. Thus you can attach your phone to a GoPro Chesty, head strap, helmet strap, tripod mount or whatever GoPro item you might have. The thing is that the GoPro mount attaches to the back of your iPhone. When you attach something to it, it can get in the way of the camera. We tested the above four GoPro items and found that each system could be assembled in such way that the camera lenses could point forward without being blocked, as in the tripod mount pictured above. Maybe we are easily amused, but we found that to be an exciting development. A mobile phone can use a lot of electricity especially when you are using it’s satellite navigation system continuously. You’ll be lucky if its battery lasts one day. The solution is a battery pack. There are many types available – you will want a lithium ion pack that stores 20,000 mAh or more. That will allow you to recharge your iPhone X about seven times – at least enough for a four or five day backpacking trip. Some packs include a solar panel, so it can recharge itself. We use an old battery pack, but you might try the PLOCHY 24000 mAh solar charger. It has a 5 star rating on Amazon and purchasers seem pleased with it. Just be sure to fully charge your battery pack before starting your adventure. The solar panel is small so don’t expect it to recharge the pack very much. Nonetheless, a little extra energy could be critical in an emergency. These things are heavy. They are not designed for ultralight backpackers. The video illustrates how to apply the screen protector and case and how the various GoPro accessories work. For a larger version of the video, see the Youtube Version or our PodCast version. Your iPhone X offers great satellite navigation hardware that can replace your GPS unit. It’s assisted GPS system accesses the Russian GLONASS satellite system, the European Union Galileo system AND the U.S. GPS system. All you need are some iPhone apps that can use the hardware. There are lots of options, but we regularly use these apps. We use Komoot mostly when hiking. It incorporates a world-wide topographic basemap, allows the user to record a track on the map, and produces a profile view of the track as well. The information is uploaded to Komoot’s servers and is easily saved to your computer. You will see track, profiles and other data from Komoot in our stories. It also is designed to help with trip planning. Avenza allows you to load special maps onto your phone. All USGS quad maps are available free. There are also special maps from federal agencies and other sources that are available free or for a small fee. All these maps are available through the Avenza Store. Once on your phone, you can be far from any mobile phone service and still see your current position on the map. iBiker does things much like Komoot. We use it when bicycling or hiking a known route. It records time, distance, pace (and splits for those three), calories used and elevation gain/loss. It’s better for tracking exercise parameters than Komoot but includes no planning functions. Peakfinder uses your location to generate a display that identifies all the mountain peaks you can see. Get all the details on our blog post. One update: Peakfinder now uses augmented reality by displaying what you are really seeing via the camera with the mountain graphics overlaid on it. If you enjoy geocaching you will want the Geocaching app. 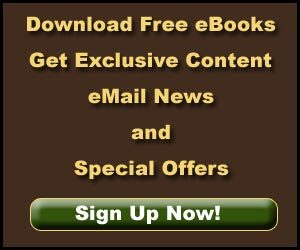 It will quickly and easily connect you to thousands of geocaches around the world. If you are out exploring rather than just getting from one place to another, there are a lot of apps that can help you learn about the world around you. Here are a few of our favorites. You can find an app for any interest just by searching for a topic in the iPhone app store. Protect your iPhone for the outdoors, get the accessories you need then load up your phone with apps that work for you. 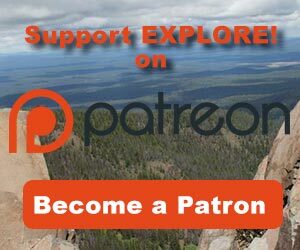 We did it and left our Canon 60D at home on a recent hike to Whitney Butte in the Lava Beds National Monument. Once we get the story video and photos together, we’ll decide if we will leave the big camera at home more often. Except as noted, all text, photography and video by Jerry Haugen, Pathfinder, and ©2017 Global Creations LLC.